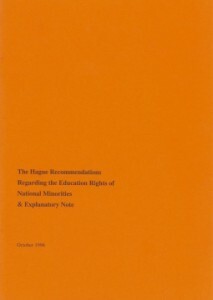 The European Foundation of Human Rights (EFHR) will attend an upcoming event to mark the 20th Anniversary of The Hague Recommendations Regarding the Education Rights of National Minorities. EFHR’s Assistant Attorney Ewelina Baliko will attend the event, which will take place from 20 April – 21 April 2016. The conference is organized by OSCE High Commissioner on National Minorities Astrid Thors. 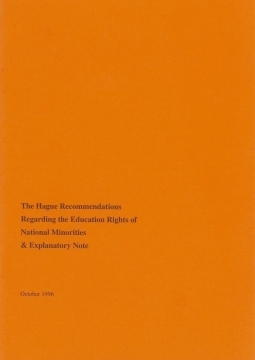 This year – 2016 – is the 20th anniversary of the launch of The Hague Recommendations Regarding the Education Rights of National Minorities. The two-day event is taking place to celebrate this anniversary and to emphasize the important role education has to play in society and conflict prevention. The event will bring together government representatives, teachers, experts in the field of education, NGO representatives and professionals in conflict prevention and peacemaking. Participants will be invited to reflect on the work of the OSCE over the last 20 years where education is concerned. 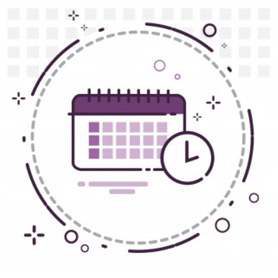 Attendees will also have the chance to consider the current challenges that are being faced in adapting education systems to suit ethnically-diverse societies. The Hague Recommendations are the first of a series of seven Recommendations and Guidelines issued by the successive High Commissioners and reflect the importance attached to the issue of education in conflict prevention and the protection of minority rights. EFHR is honoured to attend this invitation-only conference. Our inclusion is an approval of the work of EFHR and further strengthens our relationship with the OSCE High Commissioner on National Minorities. For a number of years we have maintained good relations with OSCE – in fact, just one week ago (15 March 2016) a meeting took place between representatives of the High Commissioner on National Minorities for the Organization for Security and Co-operation in Europe (OSCE) at EFHR’s headquarters.